We recently opened Outer Circle: The Boyds and the Murrumbeena artists at National Gallery of Victoria, Australia. The exhibition, which I jointly curated with my colleague Alisa Bunbury, Curator of Prints and Drawings, has been a great project to work on and we have had a lot of enjoyment in researching it and putting it together. I’m always amazed at how the process in preparing an exhibition like this takes you on interesting journeys that often reveal unexpected outcomes. Some years ago, during the early stages of preparation, I happened to mention the exhibition to my mother who is a retired art teacher. She recalled taking a group of her students to visit the Arthur Merric Boyd Pottery in Neerim Road, Murrumbeena, during the 1950s where they met John Perceval. 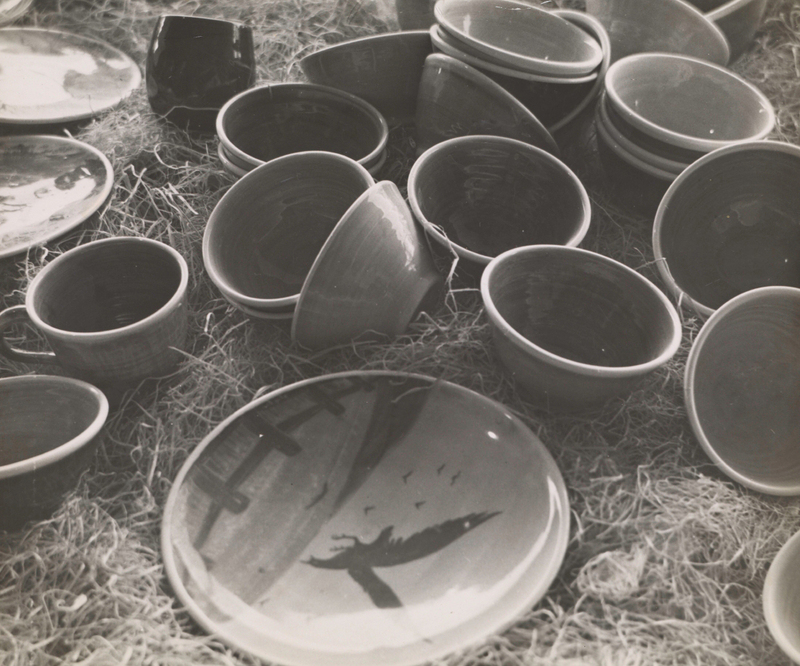 She did a bit of searching and produced three black and white photographs that had been taken by one of the students while on the excursion; one of Perceval (featured above) and the other two showing some of the newly fired pots on display. 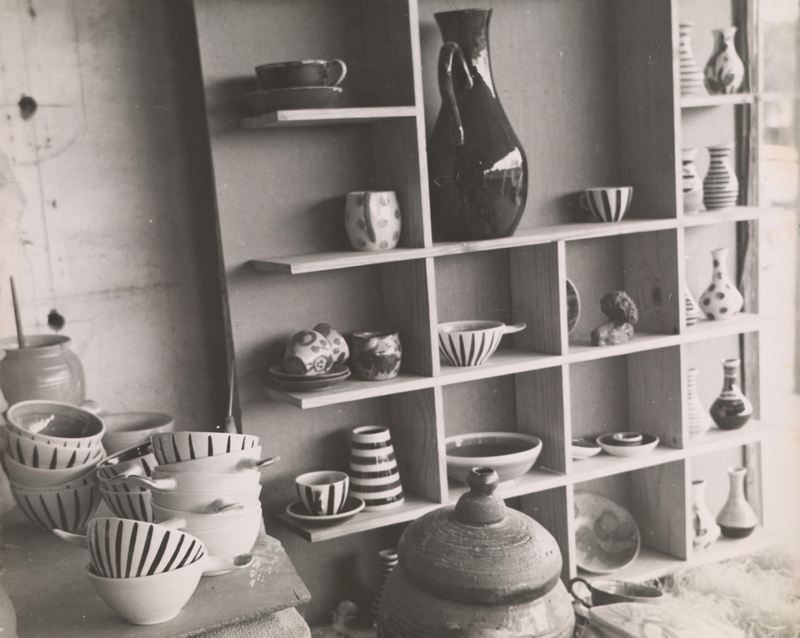 Finished pots at the AMB Pottery, Neerim Road, Murrumbeena, 1957. Photographer Donald Pitkethly. My mother remembered the name of the student who had taken the photographs and with a bit of further research managed to locate and make contact with him. He was of course a bit surprised to receive a call from his art teacher from 57 years ago! Not only did he recall the visit to the AMB Pottery, and taking the photographs, but he produced an article he had written for the school magazine which described the experience. 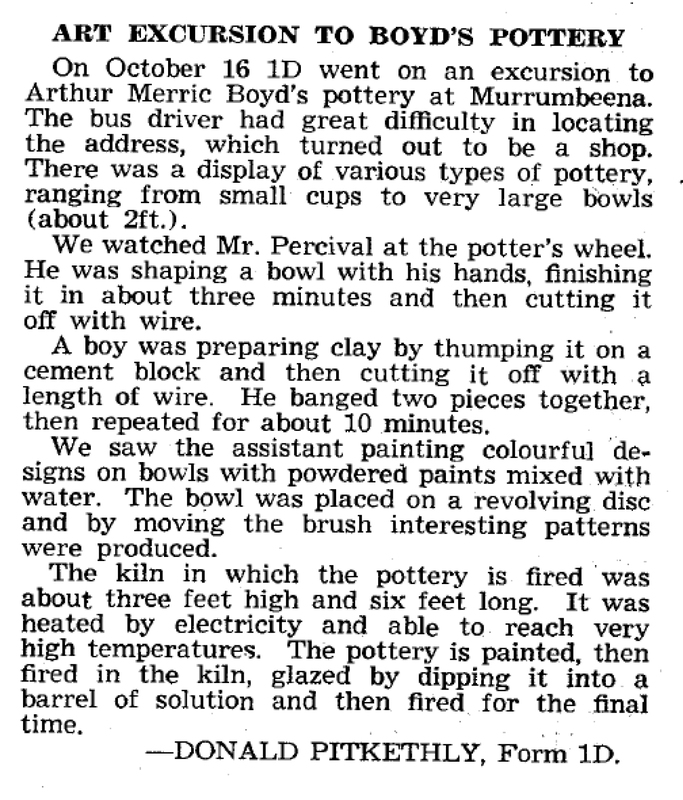 As a form 1 (year seven) student, Donald Pitkethly gives a great first-hand account of John Perceval working at the potters’ wheel. I have shown the photograph of John Perceval to his daughter Celia and she believes it is one of the nicest portraits she has seen of her father. I thank Donald for allowing me to reproduce the images and the article (included below). Shepparton Art Museum’s exhibition of John Perceval’s sculptural angels is an inspiring and timely survey of this very important part of his career as an artist. Outer Circle: The Boyds and the Murrumbeena artists links quite nicely to Delinquent Angel and for those interested in looking at Perceval’s work and early influences in more detail it would be worth making a visit.